This year, we are thrilled to welcome Helluvah, who will present songs from her second album "As we move silently". 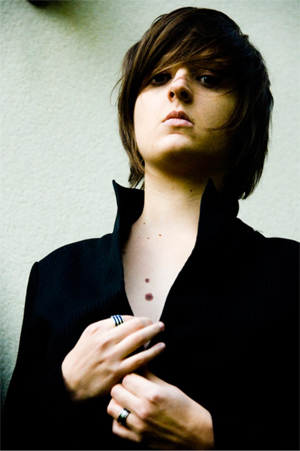 After a 5-song demo ("Lost in progress") and a French and international tour alone with her guitar, Helluvah recorded "Emotion pills", her first album, with rock/folk accents plus a touch of electro, in November 2006. This young musician then participated in both the national and international (Berlin, Madrid) editions of the “Les Femmes S’en Mêlent” festival. She released a single in the U.K, and several of her songs were included in the compilations "Have a good night 2 et 3" alongside Tender Forever, Grizzly Bear, Rubin Steiner et al. Released in 2011, her second record is intimate, thrilling, fiery... bursting with raw energy! Through these stories – her own and more – Helluvah flaunts her acerbic humor, her lucidity and her irresistible and mischievous nonchalance. Her thinly veiled lyrics evoke her loves, pleasures and regrets... and her distress at much of what’s going on in the world. If you’re not one of her groupies yet, come find out what the buzz is about on opening night of the festival!